A PWC includes jet skis, wave runners and similar vessels that have an engine used for propulsion, fully enclosed hull, don’t retain water and are operated by standing, kneeling or sitting astride. It is important to remember that PWCs are just another type of powered vessel and must be operated within the rules relating to powerboats. PWCs are generally much more powerful and manoeuvrable than traditional powerboats. They can pose a danger to the operator and to other people if not ridden safely and responsibly. Always read signage placed at boat ramps and on shore. Some local rules may apply specifically to PWCs so be familiar with the area you intend to operate in. If you are unsure of local rules and conditions, ask the local waterway manager for information. Refer to the Vessel Operating and Zoning Rules for State and local regulations relevant to any waterway you intend to use. The master of a PWC must hold a marine licence with a PWC endorsement. You must carry this licence at all times when you are the master of a PWC. You will need to sit an additional knowledge test and correctly answer a minimum of 13 out of 15 questions to pass. An operator with a PWC licence endorsement can operate all types of powered recreational vessels. This licence must be carried at all times when acting as the master of a PWC. Try our online practice tests. on board the PWC in a position where they are able to take immediate control of the vessel. Persons under 16 will no longer be issued with a PWC endorsement on their restricted marine licence but can operate under supervision as per the conditions above. It is illegal in Victoria for a PWC operator or owner to allow or cause a PWC to be used unless it is registered with VicRoads. Conditions of registration require that the PWC is in good working order and engine kill switches are operable, so maintain your PWC after each trip and have it regularly serviced. The registration label must be in a prominent position on the outside or upper part of the vessel. so that the highest part of each digit commences at a point no more than 25 mm below the gunwale. coloured in contrast to the surface on which they are displayed. It is illegal for you to act as the master of a registered vessel on Victorian waters unless an identification mark is painted or displayed on your PWC in accordance with the above. These identification marks must be conspicuous and distinguishable from any decal or striping that you may have used to decorate or customise your PWC. Interstate registered vessels must display registration numbers or marks as required by the relevant State or Territory. The buying and registration section of this website has more information on what to look out for when buying vessels and how to register a vessel in Victoria. Any person on, or being towed by, a PWC must wear an approved lifejacket type 1, 2 or 3 while underway. Our Wear A Lifejacket website has everything you need to know about: lifejacket laws in Victoria; what jacket you need to wear, when; choosing the right lifejacket for your lifestyle; and looking after your lifejacket. show the same lights for a powerboat when operating at night. Note that a mast may be required for an all-round white light to ensure the occupant does not obscure the beam. A registered EPIRB is required on all vessels, including PWCs, if operating more than 2nm from the coast. All operators are advised to carry a means of raising the alarm. A personal locator beacon (PLB) should also be considered for those not heading as far out. Keeping a PWC in good working order is not only common sense; it is a legal requirement. Look after your PWC so it looks after you – maintain it after each trip and have it regularly serviced. The trip preparation section of this website includes a full list of the safety equipment for personal watercraft. All vessels must travel at a safe speed at all times. Obey buoys, beacons and signs marking waterway zones, channels and speed limits. Be aware that at 5 knots, equivalent to 9 km/h or fast walking pace, it takes 20 seconds to travel 50 m and 80 seconds to travel 200 m.
The master of a PWC must constantly monitor the speed of the vessel to ensure that a safe and lawful speed is being maintained. Remember: stunts and manoeuvres must be done well away from other people, other vessels and the shore. If you cannot maintain the minimum distance, you must not exceed 5 knots. PWCs are subject to ‘hoon’ legislation which means owners and/or operators can be prosecuted for operating an unsafe vessel, or dangerously, and PWCs can be seized, impounded and embargoed. The main complaint about the operation of PWCs relates to their use too close to other water users and/or the water’s edge. Speed and distance regulations must be observed on all waterways, unless a specific local rule says otherwise. or as per the scheduled waterway rules. Remember: 5 knots is equivalent to 8-9 km/h. The International Regulations for Preventing Collisions at Sea (COLREGS), enshrined in Victorian maritime safety legislation, apply to operators of all vessels including PWCs. It is your responsibility when in charge of a PWC to correctly apply these rules in all circumstances. Without power, a PWC has little or no steering control – simply releasing the throttle may not help you avoid a collision. A very important rule is: maintain a proper look out at all times. water does not ‘give’ when you hit it at speed – you will probably break bones and, if you are not wearing protective clothing, sustain serious internal injuries. 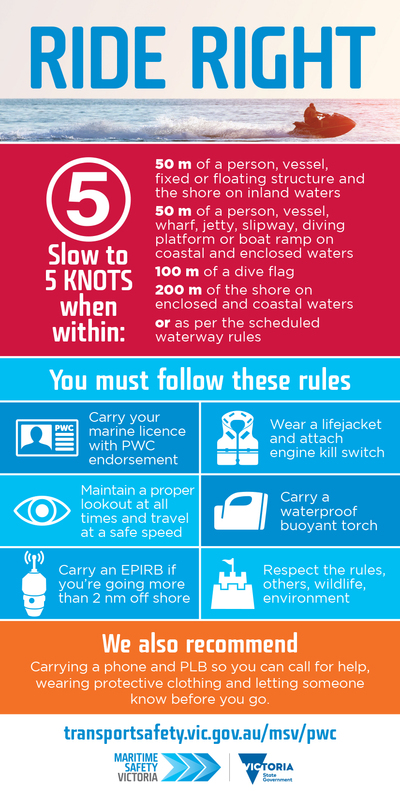 If you are participating in any towed watersports on a PWC, you must follow the relevant rules which include carrying an appropriate observer. Your PWC must have seating for the master and observer. You should also consider having adequate seating for anyone who is being towed. To determine the carrying capacity of your PWC, refer to the manufacturer’s specifications. As a PWC operator, you have a legal duty to take reasonable care for your own safety and for the safety of anyone who may be affected by your actions. Assess the risks associated with operating a PWC and be aware of the changing nature of the maritime environment. PWCs can accelerate very quickly and can be noisy. Be mindful of this when others are on or in the water, or on the beach. Understand your limitations in performance in varying conditions. Be aware that the operators of other vessels may not be familiar with PWCs and how quickly you can approach, pass, turn and move away. You may need to adjust your riding techniques so that you don’t alarm other operators. Follow the manufacturer’s instructions and maintenance schedule. Joining a PWC riders club or similar organisation will improve your skills, knowledge and experience. Owners and operators of trailer boats should make themselves aware of the following information on the VicRoads website, relating to towing loads on the road. Or send your postal address to info@transportsafety.vic.gov.au to request a Ride Right brochure and sticker be mailed to you.